Download and personally customize these PNG files on your own. This FREE package includes the blank PNG files ONLY to add your personal information yourself. The PSD files are NOT included. Add your personal text to the PNG files, or edit the original PSD files to your liking. This $10 package includes the blank PNG files AND the original PSD files for you to edit yourself. NOTE - You will be redirected to make a payment for this package. Once payment is complete, the files will then be shared with you. Contact us if this does not occur. PNG Files, PSD Files, & Our Help. ​Let us help with editing. You'll get personalized work for your streaming needs. This $17 package includes customized PNG files AND the PSD files, which we will edit for you, including your custom name, profile icon (if desired), image swaps (if desired), & social media titles. Payment will be due before work is performed. Once work is completed, we will send you the files via email. 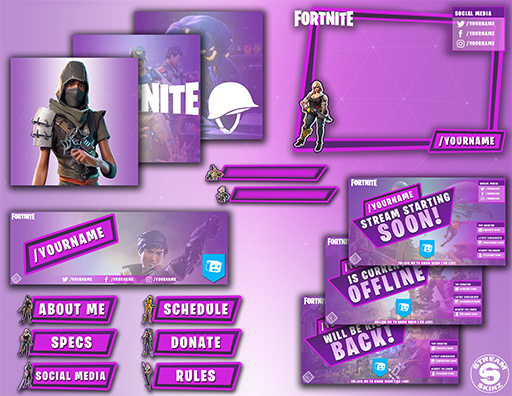 StreamSkinz inspired by the video game Fortnite, created by Epic Games. ​All images supplied will be PNG format. Any customizable text* (/USERNAME, social media text, etc.) will be left blank for you to overlay your own text with your personal editing program. *Font used - "Burbank Big Condensed"
​Any PSD/Photoshop files supplied will have text ready to change. If you do not have access to Photoshop or another digital editing program, we can professionally edit the graphics for you by request. There will be a fee for our time. Disclaimer - Portions of the materials used are trademarks and/or copyrighted works of Epic Games, Inc. All rights reserved by Epic. This material is not official and is not endorsed by Epic.